Iowa Sioux City All America City Sticker - $20.00 : Bob Hoyts Classic Inspection Stickers, Add a Final Touch to your Restoration! 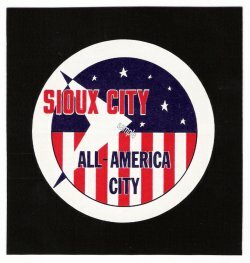 This attractive Sioux City sticker dates to the 1950s. It has been carefully restored and reproduced true to the original. It is approximately 4 inches square and come with our patented "Peel and Stick" format to allow attaching to the INSIDE window of your car. Thanks to Eric Gregory, Tuscon Arizona for this sticker.